I know from previous experience that it is all too easy for me to while away vacation time parked here in front of the computer, with the occasion trip to somewhere to entertain the boy. Time to introduce a little accountability I think. Phew! Just looking at that list makes me tired. I think I am going to go and have a nap! That sure doesn't sound like a holiday to me Marg! Yikes! Oh Marg, I make one of those lists every summer too. sigh. As a lazy person myself, I think you have put far too much on your list. That looks more like a 5 year goal to me. I think goals like - make a meal every day, or get dressed on a regular basis are really all you need to do. I will add however that taking out the too small clothes is always a task that makes me feel so accomplished afterwards, and opening the boxes sounds kind of like Christmas! Let us know if you find any great things, like a missing cheque, or a nice piece of jewellry that matches something new you've bought recently. Good luck! You must tell your curious readers about the pleasant surprises you find in all those boxes. Phew! I'm exhausted. All my best to you in accomplishing your goals. Hope you'll relish the good feelings after each goal. I know that striking a line through each item is quite rewarding. Oh wow, what a list! I agree with Booklogged that striking those out when they are completed will help you towards feeling like you are accomplishing things. That is what I do, too. I am a listaholic! I have my TBR list on Microsoft Word, and when I finish a book, I strike through it as well. It helps me to feel like I accomplished more seeing my progress than if I just delete it into nonexistence. Good luck with everything! How inspiring! I need to do stuff like this too. Raidergirl, the getting dressed isn't a problem for me, but getting much further usually is, simply because I end up sitting here all day, and then I look at the clock and go whoops there's that day gone! Carolyn Jean, I am hoping to find my old dressing gown, and a few other bits and pieces. Booklogged, I hope crossing them off is an incentive enough to keep going. I am bribing my son with a new DS if he has done his part of it. Maybe I need to give myself a big bribe! 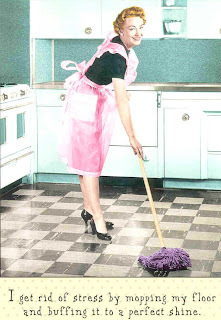 Ladytink, I don't mop, bake, iron or anything else but I did like the cartoon. Rebecca, I have lists like this for my books as well, and either delete or add as necessary. OH, and Raidergirl, I meant to say that I thought about putting cooking meals on the list, because it is amazing how many times I don't get around to cooking dinner, but then I wasn't sure about making that confession! LOL! Wow I do hope you manage to accomplish all of that and have a relaxing holiday! Good luck! That is quite a list Marg and it doesn't look fun. I hope you have a relaxing holiday. I make those lists too. I always feel purged after I clean. I need to go through all our closets. I just left you an award on my blog. That's quite the list for your vacation time. Make sure to take some time to just relax and read too. Hey Marg! I thought you were on vacation!!! ;) I didn't see nay book related tasks--if you felt that putting read a good book wasn't a worthy task to put on the list at least put a book related task of some kind on there--like: Straighten book shelves, alphabetize books on shelves, stack tbr pile and gazing lovingly at it...ect... you get the idea! LOL Kim! For some reason I don't seem to read very much on vacation. One of the things that I didn't put on the list is that I am hoping to buy a new bookshelf, and then I would need a total reorganisatio, but at this point in time Ikea are out of stock. Dar and Vickie, I'll try. Kailana, one of the boxes in the shed is kids books. Chris, I will be over to check it out shortly. Thanks for thinking of me. Michelle, I am not sure whether you can, but we will see.